Like a leaky life boat which requires constant 'bailing', our homes must have the moisture removed as quickly as it leaks in or we will "sink". Moisture "leaks" into our home in different ways and in different forms. Liquid water may leak in through cracks in an exterior wall, poorly installed siding or flashing. A leaking roof or window may also add water in liquid form. Basements and crawl spaces are a prime source for water intrusion. Water vapor can get in carried by air that infiltrates through the windows, doors or anywhere there's an opening. Water vapor can pass through what we think of as a solid wall! We must control moisture, but we cannot put up a "force field" to keep it out. Some moisture will always get past even our best front line defenses, however, once the moisture has passed through this first line of defense and entered the interior of our home, it now should encounter our second line of defense,THE WHOLE HOUSE DEHUMIDIFIER. Always on duty, its only job is to remove moisture. Unlike air conditioning systems which remove moisture only as a byproduct of cooling the home, a whole house dehumidifier is on the job 24/7. It will maintain a set humidity level around the clock, whether the air conditioner is on or not. In addition, it takes care of the whole house, not just one or two rooms. It has the capacity to remove moisture from the entire house. Portable dehumidifiers just don't have the capacity to do the job. Controlling moisture is the best way to prevent mold growth. Mold can start to grow in less than 72 hours. Why take a chance? Allergic to dust mites? They don't like it dry, so with the whole house dehumidifier they aren't a problem any more. The paint, drywall, wood trim and other materials which make up the structure of your home will last longer and keep looking good longer with lower humidity. Additional benefits include increased comfort levels - drier air makes you feel cooler. 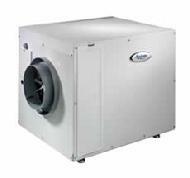 Drier air allows you to set the temperature higher and use less energy. Furniture, photographs, pianos and other valuables benefit from consistent humidity levels. Also a professionally installed whole house dehumidifier requires little maintenance, only a filter change. Get dry, stay cool and comfortable, with a WHOLE HOUSE DEHUMIDIFIER! Contact us about installing a whole house dehumidifier in your home, today!. Want to learn more about mold growth and the moisture connection? Click on the picture to the right. Does it feel damp to you?